In the hand of another filmmaker than Stanley Kubrick this wouldn’t have become the breathtakingly awesome movie this is. Full Metal Jacket is a visceral experience if there ever was one, a movie whose images will burn themselves into your memory forever. Not an unworthy beginning to a new year of blogging. But also a very controversial one. As probably most of you know, Full Metal Jacket is like two movies in one. The first part, is the boot camp part, the second the combat part. During the boot camp part the new recruits are transformed into killers, men who belong to a brotherhood. The drill instructor Gunnery Sgt Hartmann (R. Lee Ermey) is by far one of the most obnoxious war movie characters. But what a performance. Try saying one of the numerous bits he utters without stammering. 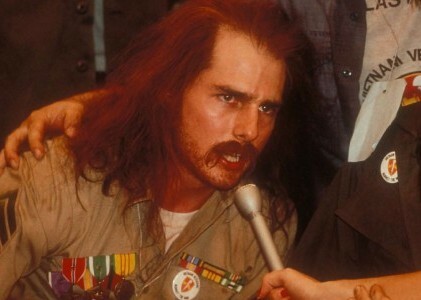 This part also introduces us to Private Joker (Matthew Modine), an aspiring, cynical journalist. Private Joker symbolizes the controversies around this war. We will see him later, in combat, wearing a peace button and simultaneously a “Born to Kill” slogan on his helmet. Another of this movies memorable characters has his major part in this sequence, Gomer Pyle (Vincent d’Onofrio), a fat and clumsy recruit who winds everybody up because they are punished for his failures that are endless. His final scenes bear all the traces of other Kubrick movies like A Clockwork Orange and The Shining. Once in the combat zone in Vietnam, we meet other colorful characters, one of them Animal Mother (Adam Baldwin), a pure killing machine. At the beginning of his stay Joker is bored like hell. He is a journalist with Stars and Stripes. The guys basically hang around and wait for something to happen and instructions on what they have to report. The Vietnamese they see are either hookers or Vietcong. Any others don’t seem to pass their radar. The last part is an intense combat part in the cit of Hue. They come under fire and some of them are killed by a sniper hiding in one of the bombed out buildings. As there may still be many people who have never seen Full Metal Jacket I will stop here. It should suffice to say that the last part is intense and not easy to watch. What struck me most in this movie are the pictures and the colours. Smoke and fire, burning red heaven, bombed out buildings and palm trees. Apparently the parts in the buildings were filmed in the docklands of London. I don’t know about the rest of the movie. The music is interesting as well. There is a mix between songs of the era and original score that would do any horror movie justice. I have left out many important, visually powerful and interesting moments. I just wanted to give a short introduction to one of the most extreme and most important war movies that has ever been made. If you haven’t seen it yet, you should watch it. Full Metal Jacket is also one of those movies that is focussing on the themes War and Journalism and Women in War Movies. Believe me, if you haven’t seen it, we got some interesting elements on both in this movie. If you have seen it, you know what I mean. I don’t think it is the best Vietnam movie. At least not for me. Of the combat Vietnam movies I consider Platoon, Hamburger Hill, and maybe even We Were Soldiers to be superior. Why? I think, it is fantastic from a cinematographic point of view, but as an anti-war statement I always found it a tad ambiguous. Pretty much like Apocalypse Now. The Scottish actor Robert Carlyle gives a stunning performance starring as Hitler. The madness of Hitler is creepy and palpable. However exactly this has been criticized. When you watch this movie you can´t help thinking all the time: how did he get away with it? He was so obviously deranged, mad and psychologically disturbed that no one should have been tempted to follow him. 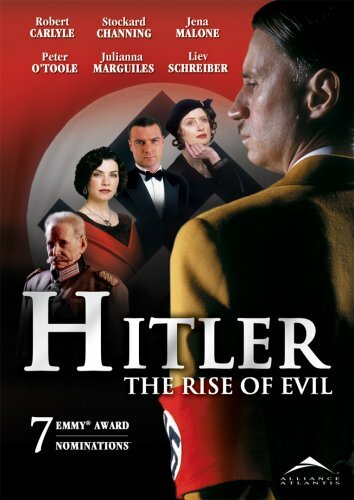 I think that in showing Hitler exactly like this, this movie contributes to shed another light on him. Sure, we know he was sick but still we tend to see him as a deranged dictator. I would say it is high time to look at him as some sort of head of a sect. He should be paralleled with people like Charles Manson and Jim Jones. The same psychological dynamics that are at work in people who follow cult leaders were also present in many Germans at the time. Nobody should compare this film to Der Untergang aka The Downfall as hardly any movie is as good as that but it is thought-provoking, interesting and, as already said, Carlyle is amazingly good.